Brescia is in Lombardy, sandwiched right between Verona and Milan and today, in my series ‘Photo of the Day’, I want to show you one of the stunning buildings there which help turn this unexpectedly beautiful city into one of Northern Italy’s hidden gems. This is the Palazzo della Loggia! Built at Piazza della Loggia in Brescia between 1492 and 1574, it stands at the place of a much smaller earlier 15th-century palace where the city council would meet. Many renowned architects oversaw the plans and the construction of the new much bigger and better palazzo. Among them was Veneto’s very best – Andrea Palladio. Five centuries later and the building is still incredibly impressive with its elegantly mathematical facade, which is covered with white marble, life-size sculptures, medallions with the heads of Roman emperors and some very intricate ornaments. ‘Would you say that this is an ‘elegantly mathematical’ facade?’, I asked showing him the photo of the palace. ‘It’s quiet stately!’, he distractedly said while picking a gummy crocodile from his secret stash. ‘Urgh! ‘Stately’ is such a boring word!’, I protested aghast. ‘I don’t know’, I tried again. ‘It looks really mathematical to me. Like, look at the proportions of the facade, like every floor seems to be about two-thirds of the height of the previous one… It’s very proportional. It just seems… Look, if I put my finger on the picture like this… Do you see what I mean?’, I struggled to explain myself as it usually happens when maths is involved. Raised cushion or not, I love the look of the Palazzo della Loggia. The best part for me is the hull-like roof which was added to the building relatively recently – in 1914. The previous roof was a flat late Baroque affair and it was constructed in 1769. In case you wonder what happened to the very first roof of the palazzo, well, this was destroyed in a fire in 1575 which also burnt to ashes masterpieces by Titian. The current 20th-century roof was actually designed in the style of the first one, so that the palazzo could finally look as originally intended. 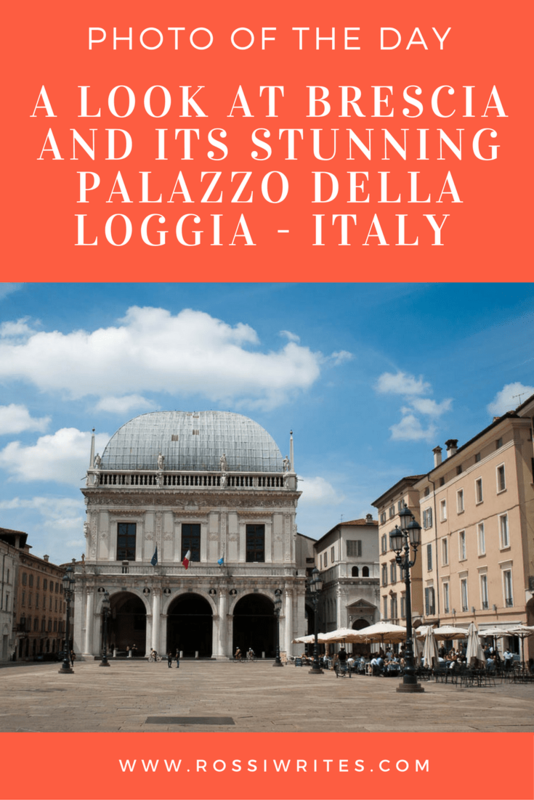 You will find the Palazzo della Loggia at Brescia’s Piazza della Loggia – a beautiful square which is not only surrounded by great architecture, but it also seems to be the beating heart of the city with its many restaurants and strict adherence to cafe culture. I took this photo on a sunny and quiet Sunday lunchtime at the start of summer. Brescia had really surprised me with its verve, its large open squares and inspiring architecture. Seeing the Palazzo della Loggia with a fluffy white cloud just hanging there above its roof was one of the photographic highlights of my day. Snap! And here it is, my photo of the palazzo. I hope you like it!